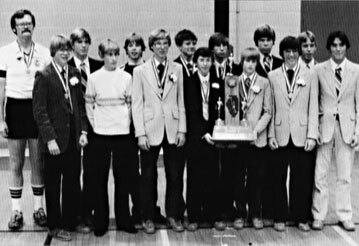 Until Bergan High School won its second consecutive boys cross country title in 1981, no Class A program had successfully defended its state championship. And the `81 Trojans did it with a lineup that included four state-finals newcomers among the seven individuals coach Mike Sullivan called on to compete at Detweiller Park. Returnees Richard Spring and Dan Ray placed third and fourth individually. But it gets better. For team-scoring purposes, seniors Spring and Ray were first and second because the individual winner and runner-up were from schools that didn't figure in the team race. Then came the state-finals newcomers. Sophomores John Stein and Craig Ray and junior Mark Cummings were Bergan's third, fourth and fifth scorers, with team places of 19, 29 and 41. The reloaded Trojans wound up with 92 points compared to 111 for runner-up Trenton Wesclin. In 1982, Bergan and Trenton Wesclin traded places. Charles F. "Chuck" Burroughs was a vital part of the Peoria boxing scene for over 60 years, his career spanning every facet of the sport from Golden Gloves champion to referee, ring announcer, judge, corner man and author. Entering the ring for the first time in 1929 as an 108-pound 14-year-old, he won his first Golden Gloves crown in 1931 in the 135 pound class, represented Peoria in Chicago at 147 pounds the next year, was a 160-pound king in 1936 and a heavyweight champ the next year. 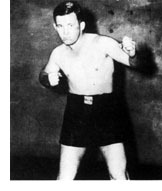 In all, he boxed in sanctioned competition in every weight from flyweight through heavyweight in his long career, leaving the amateur ranks in 1937 as a heavyweight to fight in such places as Atlantic City, Minneapolis, Chicago, Europe and Australia. Later he was a boxing columnist for the old Peoria Star and in 1977 authored a book detailing the history of boxing in Peoria. The Peoria Historical Society was given his collection of boxing memorabilia that is now housed in the Bradley University library.